I just finished creating a report that can export job ledger entries to Excel and build a Pivot Table for analysis of the data. Global dimensions and data from the master and supplement tables are included in the export. 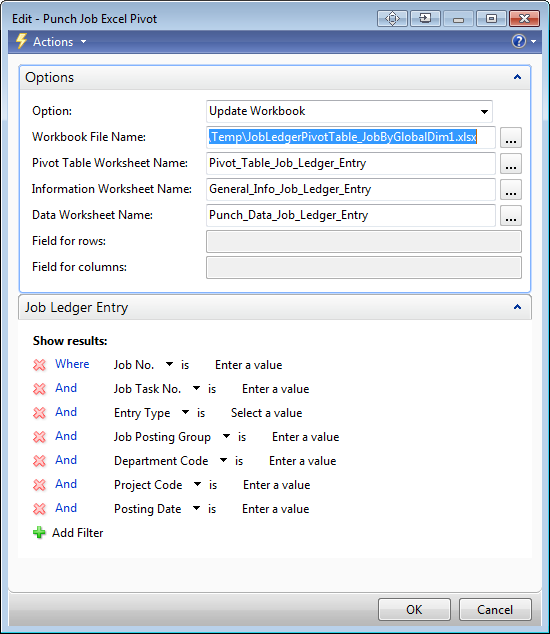 A similar report can be built for other ledger tables. The first step is to create a workbook. Fields for rows and columns are mandatory. They can be selected from a field list. 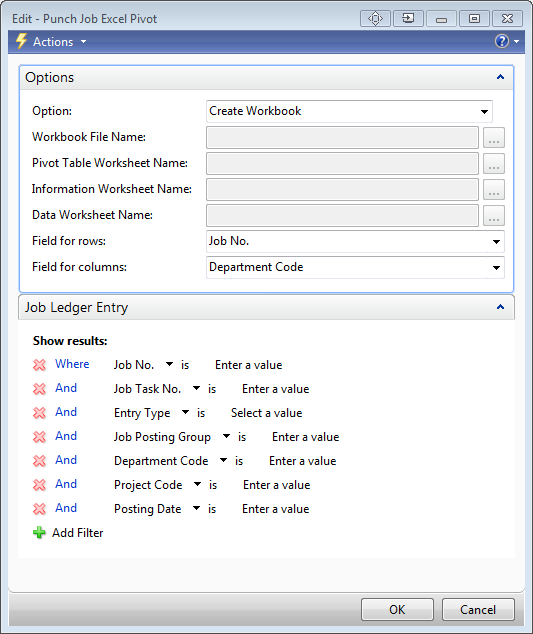 The user can filter the job ledger entry table before exporting. A text file will be created and opened by Excel. I use a system object to create the text file in the system code page. This will result in a simple pivot table in Excel. The Excel workbook will include three sheets. One for the pivot table, one for filter information and one for the data. The user can now customize the pivot table to display what ever is needed and then save the workbook to a secure location. When saving a dialog similar to the one below will appear. 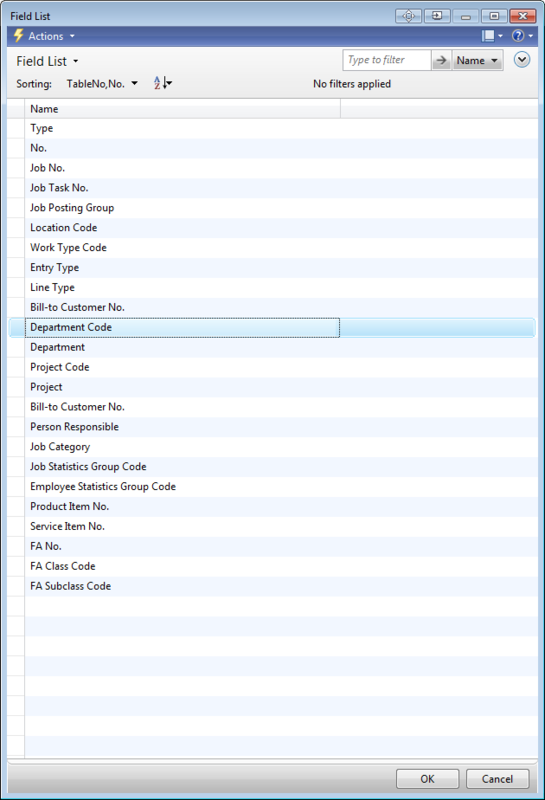 Here the uses selects No and saves the workbook in an Excel format. Then the user can update this workbook with new data. When updating a workbook the previous data is completely replaced. Run the same report and change the option to Update Workbook. 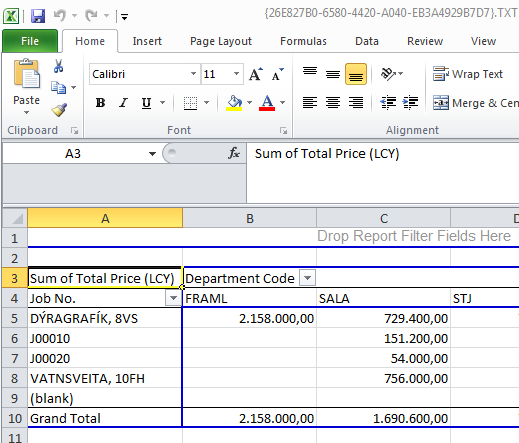 Select the Excel Document and the sheet names will be automatically applied with standard names. This will give the user a fresh data and a updates pivot table that can be saved to a different file name if needed. Then code is somewhat based on the solution from Microsoft that exports Account Schedules to pivot table and I use four basic functions as shown below. And after creating the text file these functions are executed. If you, your company or your client would like to have this solution for other ledger tables just contact me. The zipped attachment below is encrypted, please look at the product page for more information. I have installed NAV 2013 on a Windows 2008 Server. Everything is working fine and it is time to create the OneClick installation source. I followed the documentation from Microsoft. Make sure that when you install NAV 2013 to select ClickOnce Installer Tools. I first found that the SDK needed for the mage.exe command is not available on the server. I downloaded and installed Microsoft Windows SDK for Windows 7 and .NET Framework 4 from Microsoft. I created the folder C:\inetpub\wwwroot\NAV2013Beta as the source for deployment and the folder C:\inetpub\wwwroot\NAV2013Beta\Deployment\ApplicationFiles for the application. I created a read only share for the folder NAV2013Beta. I copied everything from the folder C:\Program Files (x86)\Microsoft Dynamics NAV\70\RoleTailored Client to this folder. I found the folder C:\ProgramData\Microsoft\Microsoft Dynamics NAV\70 and copied the ClientUserSettings.config file to my C:\inetpub\wwwroot\NAV2013Beta\Deployment\ApplicationFiles folder. First I made sure that the server was not set to localhost but to the network server name. I found the folder C:\Program Files (x86)\Microsoft Dynamics NAV\70\ClickOnce Installer Tools\TemplateFiles and copied all files to my C:\inetpub\wwwroot\NAV2013Beta folder, selecting to merge the Deployment folder. Warning MSB3112: Two or more assemblies have the same identity 'Microsoft.Dynamics.Nav.OpenXml, Version=7.0.0.0, Culture=neutral, PublicKeyToken=31BF3856AD364E35, ProcessorArchitecture=msil'. Warning MSB3182: File name 'C:\inetpub\wwwroot\NAV2013Beta\Deployment\ApplicationFiles\Add-ins\CodeViewer\EditorComponents\Microsoft.VisualStudio.UI.Text.Wpf.KeyProcessor.Implementation.dll' exceeds 100 characters. Microsoft.Dynamics.Nav.Client.exe.manifest successfully updated. 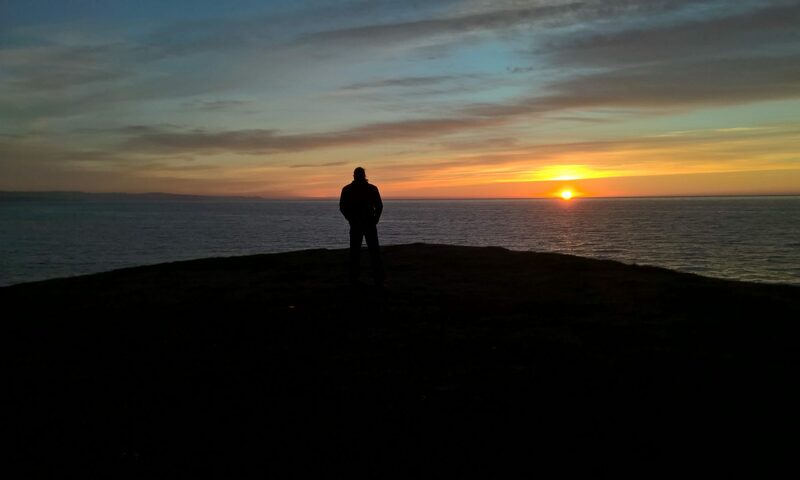 However, some errors were encountered. Warning MSB3112: Two or more assemblies have the same identity 'Microsoft.Dynamics.Nav.OpenXml, Version=7.0.0.0, Culture=neutral, PublicKeyToken=31BF3856AD364E35, ProcessorArchitecture=msil'. Warning MSB3182: File name 'C:\inetpub\wwwroot\NAV2013Beta\Deployment\ApplicationFiles\Add-ins\CodeViewer\EditorComponents\Microsoft.VisualStudio.UI.Text.Wpf.KeyProcessor.Implementation.dll' exceeds 100 characters. Microsoft.Dynamics.Nav.Client.exe.manifest successfully updated. However, some errors were encountered. Decided to remove the Development Client and only install the Role Tailored Client and restarted the process and got a better result. Again, I saved the file selecting not to sign it. In my \\nav2013\NAV2013Beta folder I used Word to create the Software License Terms for my company and saved is as Rich Text Format as PartnerSolutionLicense.rtf. Then I opened the NAVClientInstallation.html file in Notepad and removed the TODO both for the text and for the link. Next I tried the installation by browsing to the folder \\nav2013\NAV2013Beta on a Windows 2008 Remote Desktop Server and double clicking on NAVClientInstallation.html file. After a few click I had my NAV 2013 Beta up and running.